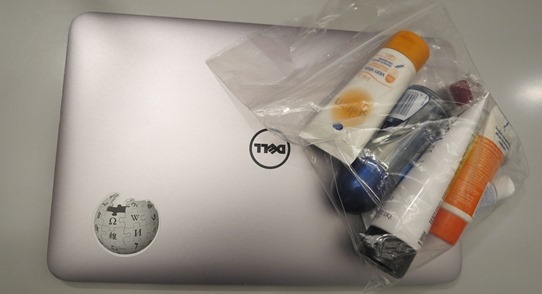 Most, but not all, airports want you to take your laptop and other ‘big’ devices out of your bag and scan them separately. So I take my laptop and iPad out and I’m told ‘put your iPad back in your bag.’ So I do and then something else in my bag causes suspicion and I have to take it out again. Not only do liquids (under 100ml) have to be taken out of your bag and scanned separately they have to be put in Heathrow’s own transparent bag and sealed up. The bag that was quite OK at London Gatwick a week earlier is not good enough for Heathrow. No requirement to separately scan liquids and, wonder of wonders, there’s a long enough lead in to the X-ray machine that you’ve got time to sort things out, remove shoes and generally disrobe, before you reach the machine. At the American Airlines terminal at least.